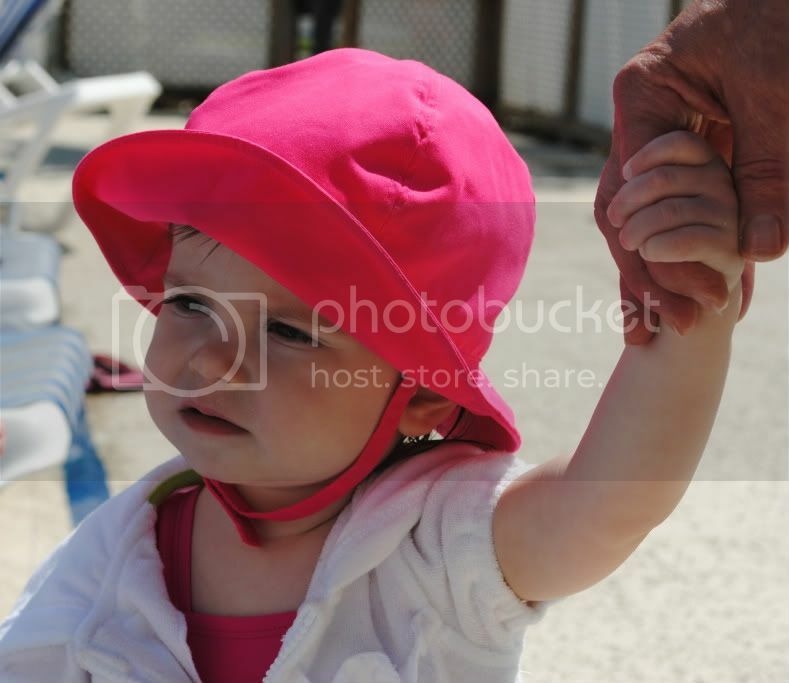 Jillian turned 16 months old while we were in Myrtle Beach and what a great place to turn 16 months!!! The last time we were in Myrtle Beach, Jillian had just turned 6 months and I kept thinking to myself the entire trip on how much she has changed. 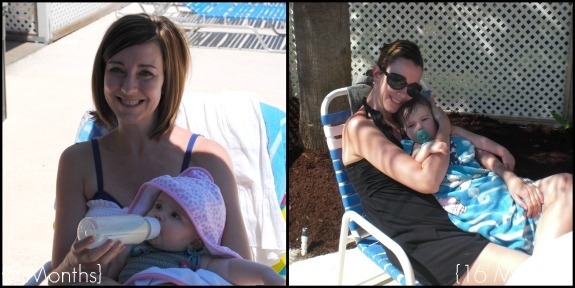 At 6 months, Jillian was still waking up at least once a night to breastfeed. At 16 months, she rarely gets up at night. When she does, I know it's something serious. This girl is really starting to become a sleeper! Lately, Jillian has been sleeping in until 8am. It's been wonderful!!! Ever since the time change back in March, she was on a 6:30am wake up time which was absolutely killing Jeff and I. We were starting to go to bed an hour earlier just to try to make up for Jillian's early wake up call. Coincidentally, in the middle of our trip to Myrtle Beach, she finally switched back over to waking back up again at a decent hour. Jillian typically takes a one two hour nap a day starting around 11:30am. Every now and then she will take two naps but it is certainly no longer the norm any more. At 6 months, we Jillian tried rice cereal for the first time in Myrtle Beach. 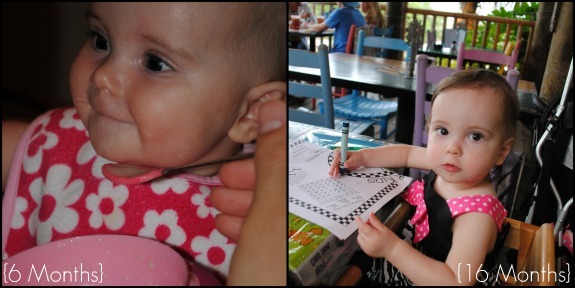 At 16 months, she is a big girl now sitting up in high chairs at restaurants and coloring!! Jillian is starting to eat a lot more lately too. She is not as picky as she used to be and has even started to like pasta! She is still not a fan of it covered in tomato sauce, however she loves eating the noodles in chicken noodle soup and will eat just plain cooked pasta. Jillian's favorite fruit lately is strawberries, she just can't seem to get enough of them. She of course still is not a fan of veggies, although, I can manage to get her to eat the cooked carrots in chicken noodle soup. Needless to say, chicken noodle soup is a staple in Jillian's menu since that is one of the only ways she will eat pasta and carrots! She is even starting to prefer those two items over the cooked chicken which is unusual! Jillian also still purrs like a cat when she eats, I love it!! I thought this would be something she only did as a baby but she is still a hummer! I need to get this on video again because I just love it and hope she never stops. Well, at least until she goes to Kindergarten! 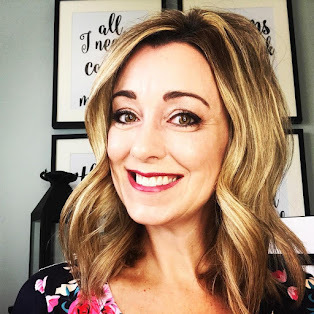 Due to Jillian's recent diagnosis of a milk allergy, our pediatrician is recommending that she stay on the formula that we have been giving her until she is 2! Because of this, she is still on bottles. Partly my fault, I love giving her a bottle and cuddling with my baby, but now that we know what our plan is, I really need to start switching over to sippy cups. I tried transitioning her while we were in Myrtle Beach. I figured since I was going to be with her for 8 straight days, I could easily work with her. Yeah, right. As soon as she realized that formula was in her sippy and not water, it instantly went on the floor. Daycare swears to me that she will drink formula out of a sippy there, however, she has shown absolutely no interest in drinking formula out of a sippy with me. Perhaps she feels the same way I do about our bottle cuddle sessions and isn't ready to give them up either. Even though she is still drinking formula in a bottle, I taught her how to drink out of a cup with a straw around 15 months old. I no longer have to worry if I forget her sippy cups when I go out to dinner. Most restaurants have kids cups with straws. It has saved me on several occasions when we are out running errands and suddenly decide to grab something to eat. 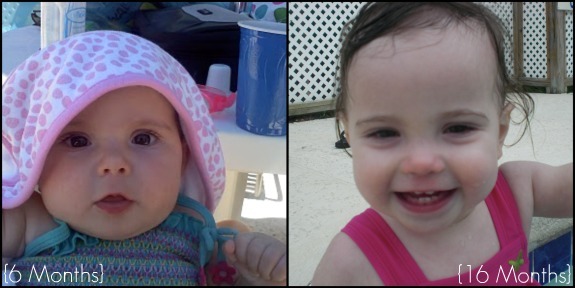 At 6 months, Jillian loved swimming in the pool in Myrtle Beach. She wasn't afraid of water at all! Since she loves bath time so much, I am sure she feels like she is in one big bath tub! And look at those rolls!!! Oh how I miss them, she is such a skinny minnie now. 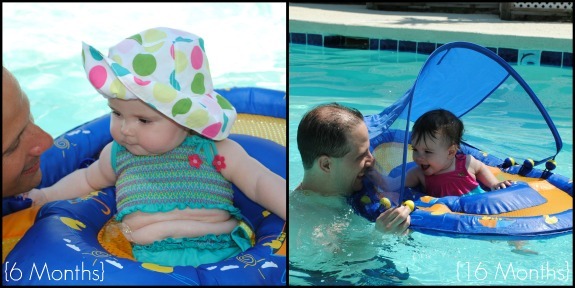 At 16 months, she loved the pool even more and loved playing in the water with Daddy. She is definitely Daddy's little girl. Relaxing and cuddling with Mommy after a long day of playing in the pool. We had so much fun in Myrtle Beach, I can't wait to go back and create even more memories with my baby girl! Weight: 20 pounds exactly(5th percentile). Clothing: Jillian is fitting comfortably in 12 month clothes in both pajamas and regular clothes. I do not see her fitting into 18 months any time soon, she is a peanut! 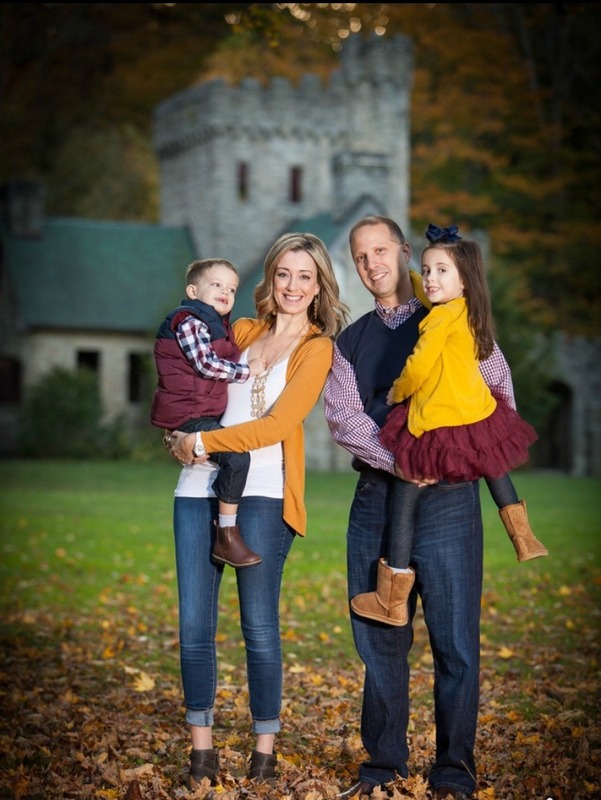 Height: Jillian was not measured at her last appointment, as of 14 months she was29.1 inches (25th percentile). Favorite Toys: Fisher Price Rings, Playskool Ball Popper, Fisher Price Kitchen, Fisher Price Laugh and Learn table, balls of any kind, Fisher Price Stroller Walker, and Little People sets. Favorite Book: Jillian's favorite books are the Sesame Street books from the Target dollar section. We own at least ten of these and she absolutely loves them. I pick her up one practically every time we are in Target and it entertains her throughout our shopping trip. And since you all know how much I love Target, those trips can be a bit long at times!!! She also loves The Ten Little Ladybugs and A Cuddle for Little Duck. Jillian also will point out all of the lady bugs in any book we are reading, if there is a lady bug in a Sesame Street book, she likes to point it out to us. It's adorable. Least Favorite Past Time: Diaper change. She is also hit or miss with the high chair. Sometimes she hops right in, other times, she puts up such a fight, that we have to sit her on our laps just to eat. I am wondering if she is getting ready for just a booster seat. I am sure she would get a kick out of eating with us at the table sitting in a booster. Teeth: Jillian has 7 teeth, three on the top and four on the bottom. Communication: Jillian's vocabulary is growing by the day. She can now say Mama, Dada, Mommy, Daddy, Apple, Ball, Pappi (for Paci), vroom vroom, uh-oh, hot dog, Mammi (for Maggie, Jeff's parents dog), bye-bye, and elmo. She loves to wave hello and good bye to everything. Claps all of the time. She loves to giggle, laughs and give "smooches". Loves to play "So Big!" and "Where is Jillian?" Jillian officially started walking in the beginning of April, right after she turned 15 months old. I never had a chance to document it or post the video that we took since that was at the beginning of my crazy illness. I will have to remember to download it and post it on here. I certainly can not forget such an important event in her life!!! It's been an amazing month with my sweet girl. She is such a blessing to us, we praise God every day for allowing us to be her parents. Having a child that will sleep is a blessing! Yay you! yay!! 16 months? Only a month older than my little one! She's so big and so adorable! congrats! Happy 16 months...they grow fast don't they?! Loved this post. How they change. Jillian has a lot of similarities with Liza....especially with strawberries right now. Happy 16 months Jillian! She and Leah are SO similar in almost ALL ways! She has all of the Target Sesame Street books too and LOVES them! I love your then and now pics from Myrtle Beach! Happy 16 months! I will have to check out the Target section for the books.